Looking for somewhere to host your next birthday party or bar/bat mitzvah? Ctrl V North York has a 5,000 square-foot facility capable of easily accommodating you and all of your party guests. With 17 VR Stations, a wide variety of content and a private party room available for post-play celebrations, your next party is bound to be unforgettable! * plus TAX. Includes 10 VR Stations for one hour followed by 40 minutes in the private Party Room. Planning a birthday celebration? 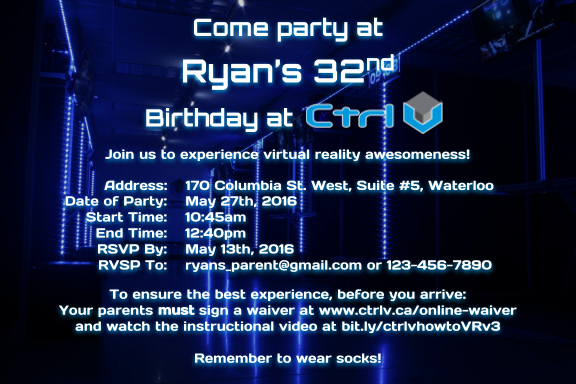 Let Ctrl v North York help host your party! We can help take away the party planning stress and allow you and your guests to fully enjoy themselves. We have multiple party packages and a private party room which will meet all your birthday party needs. If you book 10 or more VR Stations, you can also add the private Party Room to your booking for the 40 minutes following VR. The private Party Room includes tables, tablecloths, a full-sized refrigerator with freezer and enough seating for up to 20 guests. You are welcome to bring your own food, drink and dinnerware. We have a 5,000 square-foot facility that can easily accommodate up to 80 people. Planning to bring more guests than the number of stations you booked? Guests are welcome to take turns in our stations and switch as often as they like. We provide the VR equipment, games, staff to offer guidance and suggestions for playing the games. In the party room, we provide tables, chairs, tablecloths, a refrigerator/freezer, and we clean up afterward. You should bring decorations and anything that you want to serve. Some guests bring all their own food and drinks, while others arrange to have it delivered. IS THERE ANYTHING MY GUESTS AND I SHOULD DO BEFORE WE COME? While we do not have any minimum age or height requirements, the headset needs to cover the entire face and the guest would need to be old enough to understand our instructions on how to play the games. Our experience has been that being at least 7 years of age works best, although we have had some as young as 4 play without any problems. DO YOU HAVE AGE APPROPRIATE GAMES? We have lots of games that children love to play. Our most popular children’s game is Job Simulator because it offers them a chance to discover for themselves how to complete various activities. We also have a wide range of multiplayer games that will allow the children to play together or compete against each other. In Smashbox Arena, the players can form teams of 3v3 to play a high tech version of dodgeball. In Cloudlands Minigolf, up to 4 players can play together. Our game library contains some games that are recommended for players who are 18+ due to mature content and/or language. At your request, we can set the stations so that these games are not available for your party. We have an application that will allow the children to use a microphone that is built into the headset to speak with each other. This means children that are playing different games can still communicate with each other.